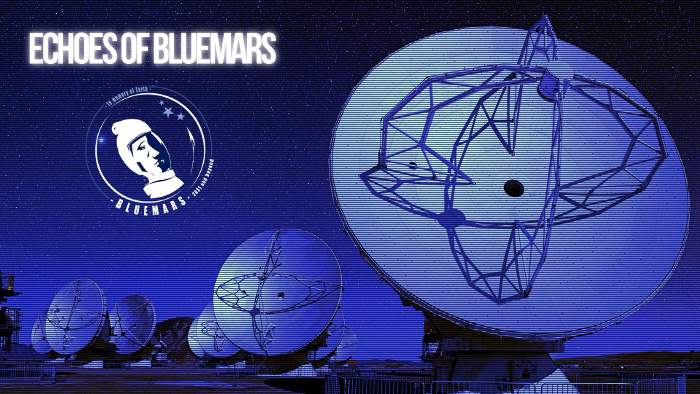 In attempts to reestablish communication with the lost Bluemars fleet, an echo of past transmissions was found. Retransmitting signals from years ago, these echoes give us a glimpse into the past. Choose a stream and enjoy the ambiance. 2016-04-28@15:08:42: Echoes now has a redundant server in Europe in addition to the one in North America routing listeners to the nearest location. This will help cut bandwidth costs, as well as make the streams quicker and more resilient for everyone. Thanks to traveler Tord and bylan.net for donating the server. 2015-12-20@15:55:21: A connection limit within Icecast was found to be causing track information to not be updated when there were 100 listeners, along with capping the the maximum number of listeners. This has been increased to 500 and can be increased further as needed. Thanks for listening, travelers. 2015-03-02@01:35:35: Echoes will be down for a maintenance window beginning 2015-03-08 at 18:00:00 UTC. The maintenance window is for 2 hours, but hopefully will be quicker. The maintenance will address some Xen security issues with the hosting provider. Thanks for listening, travelers. 2015-01-04@14:39:37: Echoes has now existed for a little over a year and as word has spread the response has been great. We're almost always over 50 concurrent listeners and have surpassed the 100 concurrent listeners threshold multiple times. The number of thank you emails I receive has been overwhelming and although I haven't always replied to all of them they all get read. It's great to know how many fellow travelers missed Bluemars as much as I did. Looking forward to continuing the journey in the new year. Thanks for listening. 2014-09-10@19:00:00: Echoes is participating in the 24 hour Internet Slowdown protest in favor of net neutrality. For more information please visit battleforthenet.com and do what you can to help. 2014-06-07@11:23:44: Echoes has been upgraded to a new server with 4x the RAM, twice the disk space, more bandwidth and is now running from SSD rather than spinning disk. Thanks for listening. 2014-05-18@16:59:40: replay_gain normalization has been disabled on the streams - I believe that's the cause of some cracking and clicking in some tracks, as the files sound fine by themselves. The downside is you may notice more of a volume difference between tracks now. 2014-01-12@17:18:40: Premonitions of the future have been added to each playlist page, showing the next 10 transmissions to be played. 2013-12-27@15:18:57: I've written a script to make it easier to replace tracks automatically with original sources as I get them, so this should pick up steam. More tracks have been replaced, though still only 6% of the Bluemars stream is from fresh sources. Cryosleep and Voices have yet to be tackled. 2013-12-23@18:22:58: The interval at which the playlists are reloaded to check for new tracks has been changed to only reload when there are changes. This will ensure that all tracks are played in a randomized order without playing a track more than once before all others have been played. 2013-12-08@19:59: Echoes now has Facebook and Twitter accounts. You can follow there for news and updates as well as on the website. 2013-11-30@13:42: I've begun tracking down alternate original sources to clean up transitions between tracks. So far only 2% of transmissions have been corrected, but many more will come. 2013-11-30@13:39: Replay gain is now used for all transmissions, to normalize volume tailored for the human ear. 2013-11-26@02:42: Current track and current/peak listener info is now live on each of the stream pages. 2013-11-26@01:52: I've fixed an issue with the .m3u extension being doubled in the stream URL which was causing problems for some players like iTunes. You may need to re-add the stream to your player after this change, but it should fix issues some were having listening in. 2013-11-24@17:48: Welcome, traveler. Echoes of Bluemars is live! I hope you enjoy this resurrection of the Bluemars ambient music streams and site style.